Fangtom is a Ninjago Minifigure released in 2012. He is exclusive to 9445 Fangpyre Truck Ambush. Fangtom's head is completely red with narrowed eyes and two heads. The head is the same mould used for Fangdam. The only difference is the widening of the eyes, and the colour of the back of the head. He has white stripes on the back, and Fangdam has black stripes. He once accidentally bit himself while trying to turn someone into a Serpentine which caused his head to form into two heads. Fangtom's torso is also completely red with white scales from the top to the bottom of his torso, and also continuing on to half of his tail. His torso is similar to Fangdam's, the difference being Fangtom has larger black markings on either side of the scales. Another note worthy difference is that he has red arms, where as Fangdam has white. Like all the other Tribe Generals, Fangtom has a tail, but in red. Fangtom is released with one accessory- a Fangpyre staff. Fangtom and the rest of the Fangpyre were released from their tomb by Lloyd Garmadon in the Ninjago: Masters of Spinjitzu (TV series) episode "Snakebit". Lloyd asks Fangtom if he and the other Fangpyre will attack the Hypnobrai tribe as revenge for betraying him. Fangtom agrees, but states that the Hypnobrai are strong and his tribe is "few in numbers", so he needs "reinforcements". He then sends his soldiers to go to Ed and Edna's Junkyard at night and turn broken vehicles and junk into snake-like vehicles: the Rattlecopter, Fangpyre Truck, Fangpyre Wrecking Ball, several Bite Cycles and the Fangpyre Mech (however, this is not seen being transformed in the TV series). Fangtom also attempts to turn Ed and Edna into warriors for his army, but his plan fails the next day when the ninjas get the Fangpyre staff with the anti-venom to reverse the effects of the bite. Fangtom appears in the episode "All of Nothing" when he talks to Skalidor and Acidicus about The Great Devourer and the Fang Blades, prior to Pythor P. Chumsworth in the Serpentine's underground fortress. 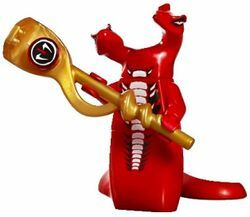 Fangdam is shown with Fangtom's torso in Ninjago: Masters of Spinjitzu (TV series) (Except in episodes Double Trouble and Snakebit). His two heads always seem to take turns speaking and usually finish each others sentences. In the TV series, Fangtom is referred to as "Fangpyre General" in the credits and is voiced by Mackenzie Grey. He appears to be good friends of all the serpentine generals; However, he seems to turn back on Skales in "Day of the Great Devourer"
This is a description taken from LEGO.com. Please do not modify it. Fangtom is the General and brains behind the Fangpyre tribe – which is not saying much. As the (double) head of a strong but fairly small tribe, Fangtom’s best bet is to use the Fangpyres’ greatest strength to create reinforcement: their venom can transform anyone or anything into a snake. Once Fangtom accidentally bit himself, which is why he now has two heads that finish each other’s sentences. You might say he bit off more than he could chew... Fangtom and Skales were and still are great friends. During the Serpentine war, though, Fangtom and Skales rarely saw each other and Skales was but a Warrior and Slithraa led the Hypnobrai tribe to many victories against the Fangpyre. The Fangpyre General-Fangtom and his staff. Fangtom on the cover of "Tomb of the Fangpyre"
Fangtom is the General and brains behind the Fangpyre tribe – which is not saying much. As the (double) head of a strong but fairly small tribe, Fangtom’s best bet is to use the Fangpyres’ greatest strength to create reinforcement: their venom can transform anyone or anything into a snake. Once Fangtom accidentally bit himself, which is why he now has two heads that finish each other’s sentences. You might say he bit off more than he could chew... Fangtom and Skales were and still are great friends. During the Serpentine war, though, Fangtom and Skales rarely saw each other and Skales was but a Warrior and Slithraa led the Hypnobrai tribe to many victories against the Fangpyre. This page was last edited on 9 January 2016, at 22:14.